While away for a couple of days, I was trying out a limited palette of colors that I don't usually use. I decided to practice with the colors that I had taken with me. It was nighttime and I was too antsy to wait until the next day to paint outside...so I started to try some mixtures. Elizabeth Tolley, whose work I very much like, has an instruction book for plein air painting: "Oil Painter's Solution Book-Landscapes". Her book is filled with her paintings for the purpose of allowing the reader to try to emulate and thus learn from her process. Though I did not use her palette of colors, I did use one of the paintings from her book. 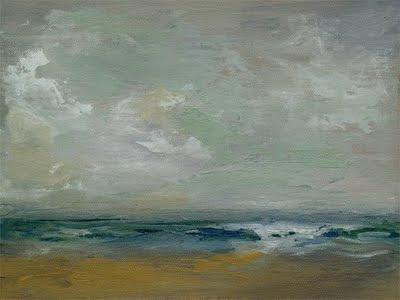 ...I'm still deciding on a plein air palette, but I like this little one.